← What Does It Take To Get People to Stop Plowing Through Passengers at Muni Stops? 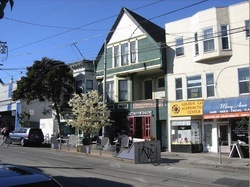 Show Your Support Tomorrow Morning for the Parklet In Person, Or Via Petition! Regular readers know that I’ve been one of the proposed 9th Avenue Parklet’s supporters – that’s no surprise. As an avid fan of Park(ing) Day, I think this project is a great idea and will be yet another improvement to our neighborhood. Tomorrow, at 9am, there’s a hearing at City Hall, Room 400 where public testimony will be presented on the project. As always, when they schedule these things early in the morning, that excludes anyone who can’t have the flexiblity at work to attend (myself included). So, in light of that, you can send an email or sign an online petition indicating your support. What’s nice about this project is that it isn’t going to cost the City any money, and if after it’s installed, if it doesn’t perform as hoped, it can always be moved to a new location (although another permit would be needed). Update: Streetsblog SF reported that the landslide of support for this project was pretty amazing. I’m not surprised, since there was so much outreach done on behalf of the project. It was telling that what little opposition there was didn’t obey the rules for public comment, and had arguments so poorly articulated, they were not taken too seriously. This entry was posted in N Judah News, News & Politics, Urban Life and Culture. Bookmark the permalink.